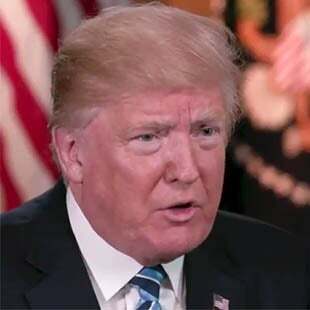 RUSH: We’ve got some Trump sound bites here from a interview that Lester Holt secured with Trump, Trump’s first interview since the firing of James Comey. And I don’t understand this, but NBC has released a lot of it. Not the whole thing. Like CNN aired three different excerpts. Why would you do this? I mean, why wouldn’t you hold it all for original broadcast on the NBC Nightly News? Well, I know what they’re thinking. Their thinking is that they can tease people to tune in and watch the whole thing if they give them just a few snippets. But if you choose the wrong snippets and you give the primary interest people have, then there’s gonna be no reason to watch the whole thing. That’s just me. That’s old school broadcast thinking. If I had an exclusive like this, I wouldn’t do it anywhere else except this show. I mean, I wouldn’t even put a little excerpt out. Maybe on my website. Maybe. But I certainly wouldn’t give it to anybody else. But that’s how the establishment works. HOLT: You had made the decision before they gave it to you? HOLT: So you’d already made the decision! THE PRESIDENT: Oh, I was gonna fire regardless of recommendation. HOLT: So there was (unintelligible). THE PRESIDENT: He made a recommendation. He’s highly respected, very good guy, very smart guy. The Democrats like him; the Republicans like him. He made a recommendation. But regardless of recommendation, I was going to fire Comey. THE PRESIDENT: Because he told me that. I mean, he told me that. HOLT: He told you you weren’t under investigation regarding the Russian investigation? THE PRESIDENT: Yeah, and I’ve heard that — I’ve heard that from others. THE PRESIDENT: I had dinner with him. He wanted to have dinner because he wanted to stay on. We had a very nice dinner at the White House early on. HOLT: He — he asked for the dinner? THE PRESIDENT: The dinner was arranged. I think he asked for the dinner. And he wanted to stay on as the FBI head. And I said, you know, “I’ll consider. We’ll see what happens.” But we had a very nice dinner. And at that time he told me you are not under investigation, which I knew anyway. Where they were going with this was they were trying to get McCabe to say anything that they could interpret as Trump’s lying about this. They want to be able to say that Comey never told Trump he wasn’t being investigated. They want to try to make anybody and everybody they can believe that Trump is lying and making this up, and he made it up and lied about it so boldly that he put it in the resignation letter to Comey! So he doubles down on it today! “Yeah, Comey told me at dinner! He asked to come to dinner; he wanted to try to stay on. “He told me three times I wasn’t under investigation. I knew it anyway.” And hear me! Hear me! He wasn’t and isn’t. It’s not a criminal investigation, folks. It’s a counterintelligence investigation. It’s a big difference. They’re not looking at criminal activity here, particularly at Trump. Everybody is hoping they find some. That’s what makes this so outrageous! It is a witch-hunt, a fishing scheme. Who knows whatever else this is, but there isn’t any evidence of criminality, and there isn’t any evidence of collusion yet. So the important thing here is Trump doubled down on it. He mentions it to Lester Holt (paraphrased), “Yeah, he told me three times at dinner. He wanted to have dinner! I had him over here to dinner. It’s a nice place to have dinner, the White House, very luxurious. We’ve got a great residence here, a great chef. Why not? He wants come dinner; he comes to dinner. He told me three times I’m not under investigation.” Now, the media wants you to think that Trump is so insane that he would lie about that. THE PRESIDENT: He said it once at dinner, and then he said it twice during phone calls. HOLT: Did — did you call him? THE PRESIDENT: In one case, I called him. In one case, he called me. RUSH: Okay. So you know what’s happening now. The little hamsters at the Drive-By Media are now running in their wheels like crazy here trying to find evidence that Trump has lied here. They are not gonna give up. They’re gonna find an anonymous source that’s once or three times removed from Comey who says, “I don’t think that the director would ever say that.” They’re not gonna find somebody to deny it outright. What they’ll do is they’ll talk to people who know Comey. They’ll talk to people who know people who know Comey, talk to people who know Comey and knew Comey then and might know Comey in the future. They’ll talk to people who have some connection to somebody who knows Comey who will say, “That’s not the way the director operated! That would be very, very unusual.” So they’ll do anything they can to cast aspersions on this. Because, remember, it’s personal. Trump’s a pig, and he’s got to go. This that we’re watching is character assassination, career assassination. This is what the left does. When they can’t beat people at ballot boxes, when they can’t beat people in the arena of ideas, this is exactly what they do. I just wish everybody could learn from this.